C. melleri is abundant in the bushy savannahs of east Africa, including Malawi, northern Mozambique and Tanzania. 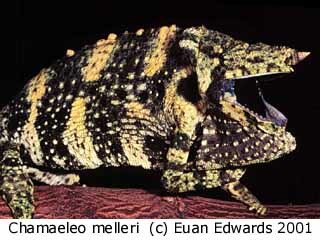 This is the largest of the African Chamaeleonidae. 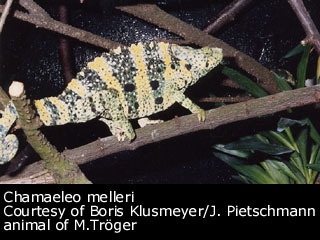 Males may reach 24 inches in total length. Females are slightly smaller. Males are highly aggressive toward conspecifics. Females are somewhat less so. Behavior toward keepers tends vary from moderately aggressive to timid. 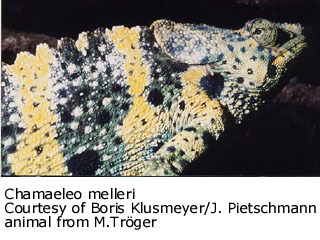 The head is relatively small compared to the rest of the body and is more elongated compared to others of the genus. A sharp medial ridge is apparent from the eyes to the tip of the snout. The relatively low casque bears greatly enlarged occipital lobes. The body is stout and the tail is relatively short, approximately 1/3 the size of the rest of the body. 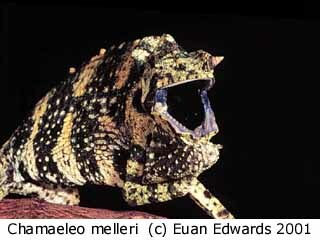 Ventral and gular crests are undeveloped but a low, scalloped crest extends from just behind the casque through the proximal half of the tail. Scalation is heterogeneous. One of the most notable features is the longitudinal rows of large, granular scales in the gular region. 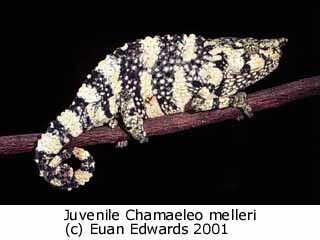 Other enlarged, granular scales are distributed homogeneously on the trunk and limbs. The basic coloration is green. Dots and broad vertical bands on the flanks may be brown, dark green, yellow or even black. In addition to being slightly smaller than males, the medial crest anterior to the eyes is smaller in females and the dorsal crest and occipital lobes are less well developed. C. melleri seem to do best with day-time high temperatures 80º-85º F although in their natural habitat temperatures may reach the high 80s. A night-time temperature drop into the low 60s is highly desirable. These large chameleons have very significant space requirements. The minimum acceptable cage size is 4' x 2 ' x 2' but larger is better. The more space they have the happier they seem to be (R. Trenor, personal communication) . 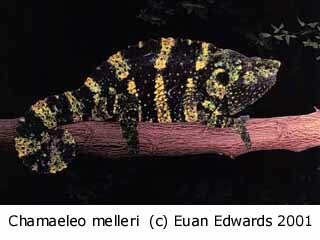 Until very recently there has been little information on the captive care of C. melleri due, in part, to the heavy parasite loads and high death rates of WC specimens. Several reports suggest, however, that this species needs a great deal of room and does best in a free-ranging set up. Hydration requirements are thought to be considerable. They have been reported to live for as long as 12 years. Fifteen to 70 eggs are laid with an average of 50 but only a single clutch is usually laid annually. Hatchlings feed well on fruit flies and two week old crickets for the first three weeks of life and then eagerly take house flies and larger crickets (R. Trenor, personal communication). Klaver, C. & W. Boehme. 1997. 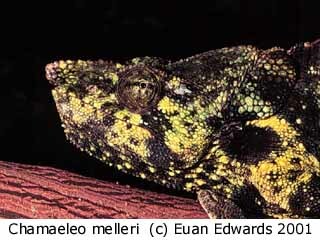 Chamaeleonidae. Das Tierreich, 112: i-xiv' 1 - 85. Verlag Walter de Gruyter & Co., Berlin, New York. Le Berre, F. 1994. The New Chameleon Handbook. Barron's Educational Series. Martin, J., 1992. 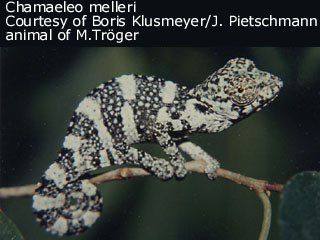 Masters of Disguise: A Natural History of Chameleons. Facts On File, Inc., New York, NY. Necas, P. 1999. Chameleons: Nature's Hidden Jewels. Krieger Publishing Company, Malabar, FL. Spawls, S., Howell, K., Drewes, R., and Ashe, J. 2002. A Field Guide to the Reptiles of East Africa. Academic Press, New York. ADCHAM logo illustrated by Randy Douglas. Web site design by Look Design, Inc.
Do not reproduce or redistibute any of content of this web site without express written permission from the authors.